The passengers of a Niki flight to Vienna from Fiumicino airport in Rome have been disembarked after a man told the pilot he had a bomb in his luggage. The plane was isolated for security checks which found no explosive devices on board. Over 80 passengers of a Niki Airbus A320 to Vienna were evacuated over a suspected bomb threat after a man of Slovenian nationality reportedly told the captain that he boarded the plane with a bomb in his luggage, local media report. La Repubblica reports that one of the passengers noticed a pedometer in the hands of his seatmate and asked what it was. The suspect reportedly answered that was a “remote control to detonate a bomb,” causing panic. The passengers warned the pilot and the suspect again confirmed he had an explosive device in his bag. The flight commander immediately warned the control tower and parked the plane in an isolated area at the end of runway, ANSA news agency reports. The suspect was taken by police for questioning while transport safety units and a fire brigade surrounded the aircraft. A security check that was carried out according to standard protocol has found no explosive devices on board, according to AGI news agency. Rome Fiumicino was temporarily locked down, with only one of its three runways operating for outbound flights and causing major delays. 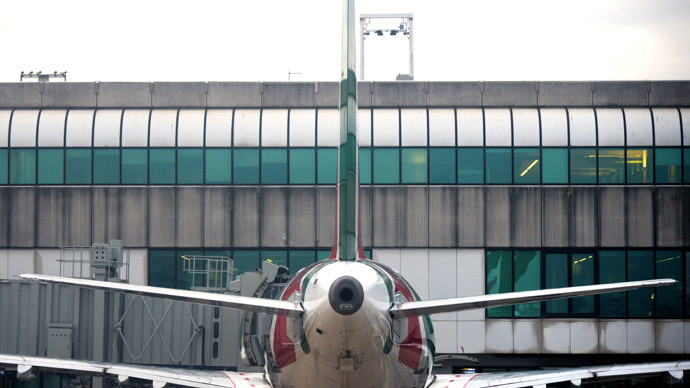 The inbound flights were reportedly being diverted to Ciampino International Airport.